I had a lot of fun interviewing Yuyang for this term’s Arts Magazine. When I asked her to describe herself, she said she is a happy and optimistic person who always looks forward to the future, and is a girl who only looks at positive outcomes and not negative ones. Yuyang loves spending time with her friends and family, chatting and laughing! She truly values her family and friends and they are the most important part of her life. In regards to her greatest inspiration, the composer Andrew Lloyd Weber is one of her greatest idols. 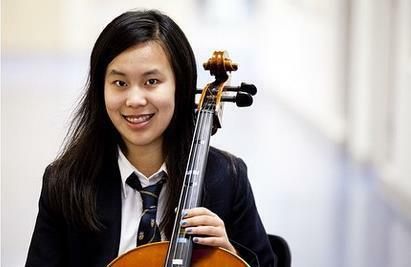 Yuyang explains that Weber’s passionate music has encouraged her to seriously study both the piano and the cello. Weber’s genius combines elements of classical and pop music to create sensational masterpieces that have overpowering emotional appeal. Almost every day, Yuyang listens to one of his musical arrangements and this motivates her to practise the piano and cello with more determination and joy. Lastly, here is some great advice which Yuyang has for you: “ Take risks! If you don't try, you'll never know. When I look back at my "music career", I noticed that I encountered many "lemon" decisions and just went for it. Even my teacher thinks I'm crazy sometimes! When I face daunting challenges, I often say, "Oh my, I am so thankful for this opportunity since it is allowing me to learn new things and take on a bigger role!" So, take risks; succeed or fail, you will gain more!” What a bright and positive girl! Yuyang does not have a favourite style of music because she believes that creativity is the most essential aspect of all artistic disciplines. She adores anything that is unique and eccentric. The song that is stuck in her head right now is “Waiting Games” by Banks or excerpts from “West Side Story” by Bernstein. Yuyang has achieved so much with her instrument; she just played at Carnegie Hall with the Honours Orchestra and returned to Vancouver the day before I interviewed her! In her own words, she said: “ It was a wonderful (but "arctic") experience; I learnt so much and absolutely loved the intense rehearsals and concerts. I am so humbled and grateful to share the stage with so many talented musicians and artists all over the world.” As you can tell, Yuyang is a very satisfied and lucky soul! Yuyang is a very bright girl and I am very grateful to have interviewed her because of her positivity and amicable nature! Yuyang has done much work throughout her music career; if you would like to hear her, look out for her at school concerts, and always remember to stop her in the hallways to ask her about her success!